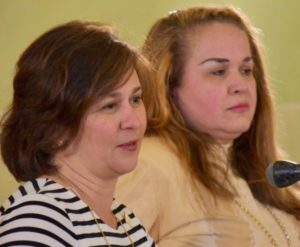 In partnership with Fuerza Laboral, Jobs with Justice and other community advocates, the Center for Justice has spearheaded the drafting and introduction of groundbreaking legislation to facilitate the creation of workers’ cooperatives in Rhode Island. House Bill 6001 and Senate Bill 676 aim to streamline the process of cooperative incorporation in the State, bringing more jobs and business opportunities to Rhode Island, as well as better working conditions for those who are often exploited in low-wage positions. 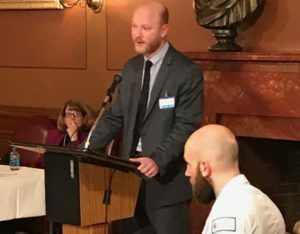 The Center for Justice has played a critical supportive role in the current campaign to establish earned sick leave as a legal right for Rhode Island workers. In partnership with the Working Families Party, Fuerza Laboral, Jobs with Justice and other groups, the Center for Justice is providing legal guidance to ensure that legislation is comprehensive and will be effective in giving workers the opportunity to earn sick leave to care for their families and themselves. If adopted, this policy will benefit nearly 170,000 workers, more than 40% of private sector employees in the State. Center for Justice Director of Policy Advocacy John Willumsen-Friedman testifies before the House Labor Committee in support of earned sick leave. 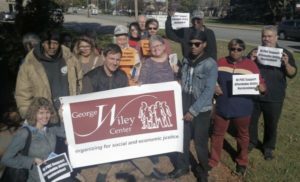 Continuing our close partnership with the George Wiley Center, the Center for Justice is successfully representing the interests of low-income utility consumers in two pending dockets before the Rhode Island Public Utilities Commission. Docket 4600 is a broad ranging “grid modernization” proceeding in which the Center for Justice has consistently pushed for the inclusion of income sensitive billing policies in order to eliminate utility shut offs affecting poor households. Docket 4651 is concerned with the implementation of a recently enacted Arrearage Management Plan which will now be accessible to thousands more low-income households because of the Center for Justice’s insistence on reasonable program eligibility guidelines and enrollment procedures. 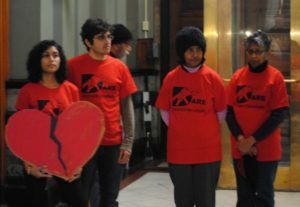 Direct Action for Rights and Equality (DARE) is continuing its decades long engagement with Providence-area tenants through a new campaign aimed to win protection against unfair and unreasonable rent increases. Center for Justice attorney John Willumsen-Friedman is providing legal assistance in the formulation of a proposed ordinance, meeting with community members at DARE and furthering the Center for Justice’s commitment to support community organizing. 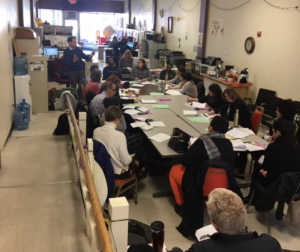 Center for Justice legal staff recently conducted an in-depth training for staff and representatives from more than 20 organizations and service providers who regularly assist low-income households in relation to utility shut offs across Rhode Island. This was a critical opportunity to share important information regarding new consumer protections, including those resulting from the Center for Justice’s class action litigation, and to coordinate advocacy among those who work daily on the frontlines of Rhode Island’s utility shut off crisis. 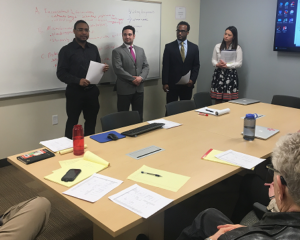 In partnership with the Pro Bono Collaborative at Roger Williams University School of Law, Center for Justice attorneys recently conducted an innovative “Lawyer in Library” program focused on landlord-tenant issues. Our legal staff provided a free “know your rights” training and answered questions from community members in attendance. Center for Justice Executive Director Rob McCreanor leads a know-your-rights training for tenants. 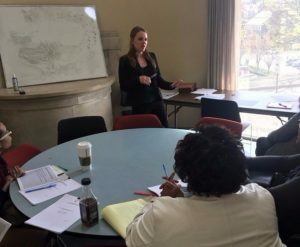 Center for Justice staff attorney Aileen Konanez meets with Providence-area tenants at DARE every Tuesday evening to provide free legal consultations on housing issues and conducts trainings for community members and service providers around issues related to housing. Center for Justice staff attorney Aileen Konanez leads a discussion on tenants’ rights. 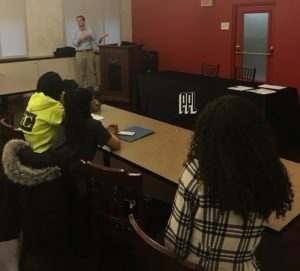 The Center for Justice hosted four law students for a one-week intensive Alternative Spring Break (ASB) through RWU School of Law’s Feinstein Center for Pro Bono and Experiential Education. Under the supervision of our legal staff, these aspiring public interest lawyers undertook a 5-day project in support of the Center for Justice’s Lifeline Project, doing direct outreach and assisting medically vulnerable to low-income utility consumers to avoid utility shut, while also investigating National Grid’s compliance with previously issued Court Orders and state regulations. ASB students present the results of their work.